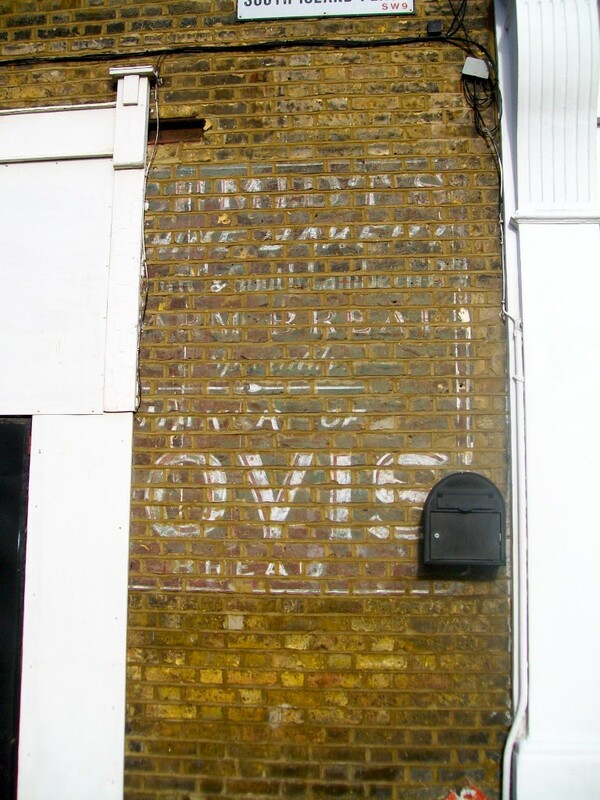 Image above – 66a Brixton Road 1910 – the year that Hovis flour got the royal stamp of approval. Left to right – William Wilson (formerly Schmidt), Nancy Wilson & Amelia Schmidt. For their huge contributions to this feature I must give my thanks to Ken and Guy Wilson, Wilhelm Schmidt’s great-grandsons. 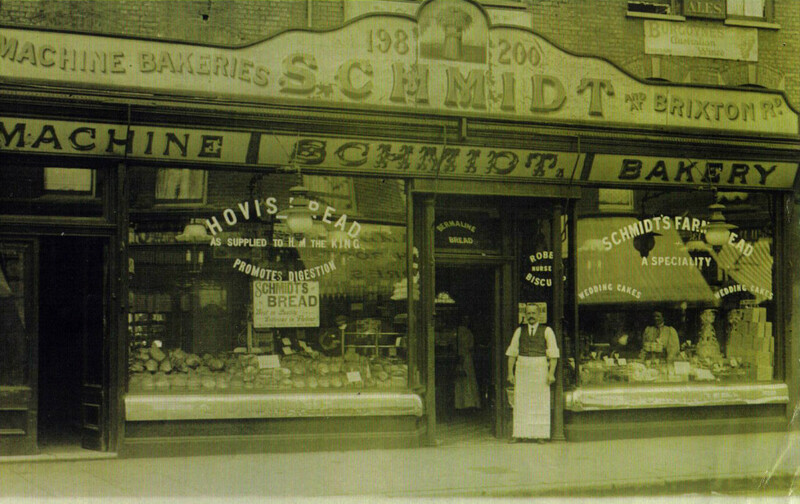 Ken and Guy have sent me some really fascinating information about Schmidt’s/Wilson’s bakery at 66a Brixton Road and a real insight into the Wilson family. Thanks also to Mike Wilson, Wilhelm’s great-great grandson for his contributions and to any local people that have sent me their memories of Wilson’s Bakery. 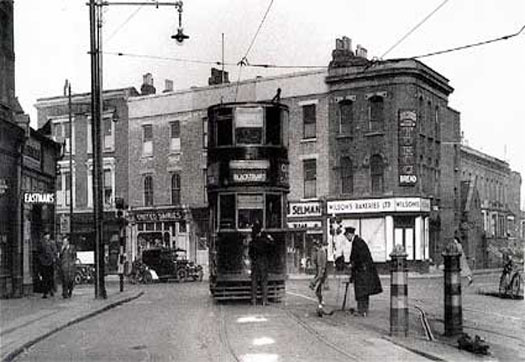 Number 66a Brixton Road is on the corner of a row that was built in the mid 1880’s along what was then a long Victorian shopping street filled with butchers, cheesemongers, hat makers, ironmongers, cafes and florists. 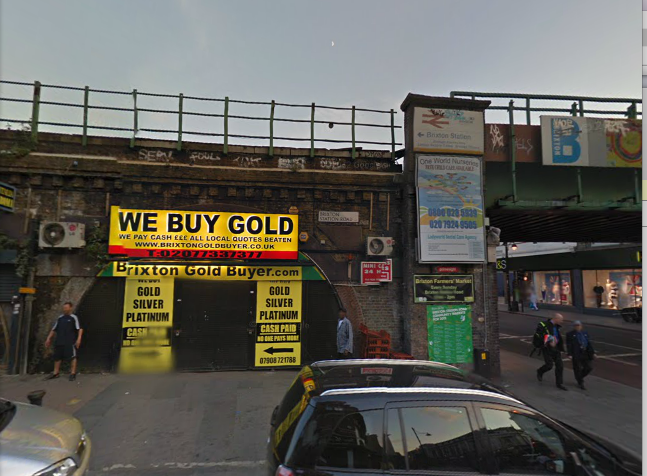 Brixton Road is now a bit tired and shabby looking, although it has retained it’s retail purpose. 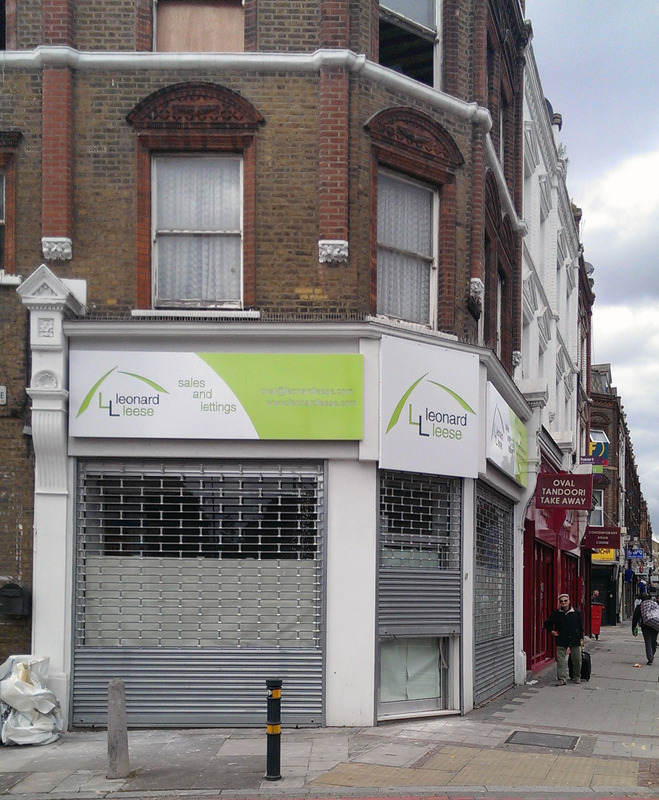 Number 66a was until recently an Italian kitchen showroom, it is now being transformed into a branch of Leonard Leese estate agents. The first shop owner to occupy number 66a was Mr Wilhelm Schmidt who came from a town in west Germany called Gutenberg. 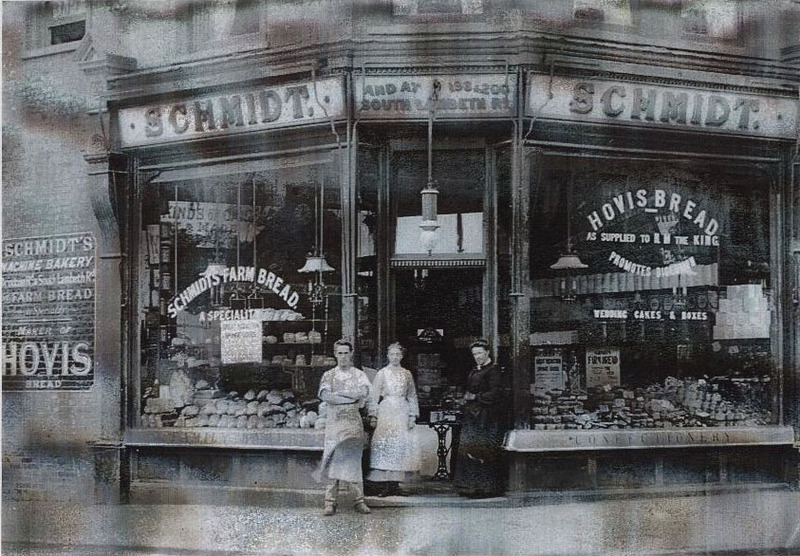 Wilhelm adopted the more English sounding name of ‘Henry’ and moved in 1886 to 66a and opened Schmidt’s bakery. He brought with him his wife Milly (Amelia) and three children. Living with the Schmidt’s was also Milly’s three sisters and a baker. The business was then run by Amelia and her sister until her son William was old enough to take over as shop owner and head confectioner. ‘My grandfather was William Henry Schmidt who changed his name to Wilson by Deed Poll in 1914, he was generally known as “Will”. The change of name came about during World War I when an angry crowd gathered outside 66a Brixton Road because of the name Schmidt Bakeries Limited. My grandfather told me that he wanted to get out of the building and thankfully it began to rain and the crowd was getting very wet and he slipped out of the side door unnoticed and went about his business. It was after this experience that he changed his name. He marveled at the fact that not a pane of glass was broken and he and his wife and two children at that time were unharmed. The name Wilson came from his wife Nancy, Wilson being her maiden name. I was very close to my grandfather especially in the 1960′s and spent many hours with him reading to him as he became almost blind. 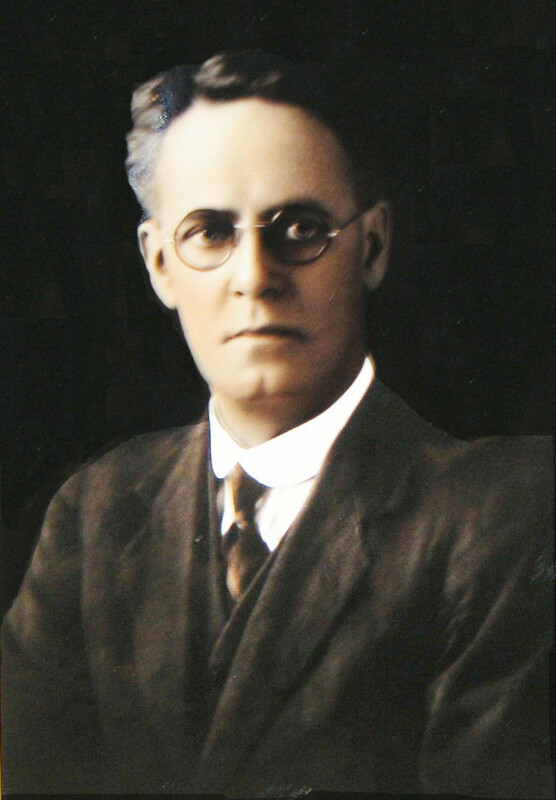 He and his parents were nominal members of the Plymouth Brethren and were practicing Christians. William owned a chapel in Offley Road. 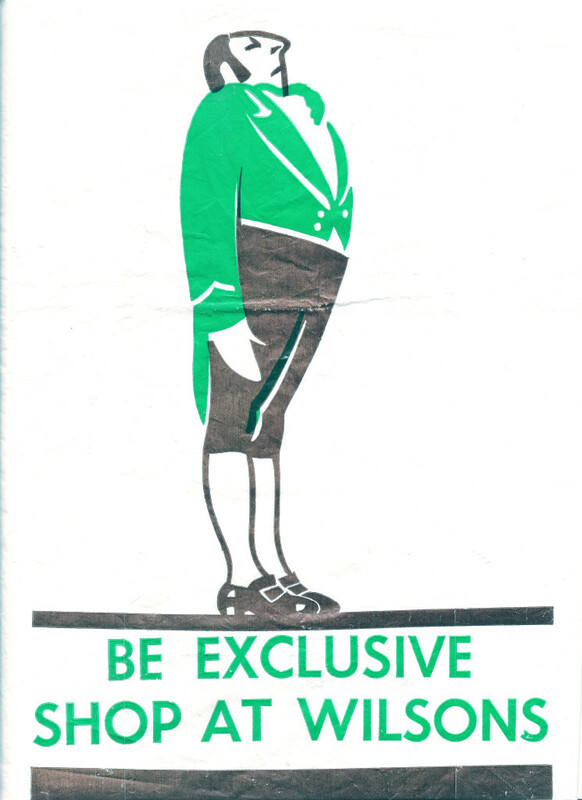 It was used by the Plymouth Brethren up until the early 1960′s. I visited the site some while back and it is now a laundry of sorts. Above – William Henry Wilson – circa 1927-1930. Below Nancy Wilson, William’s wife – date unknown. 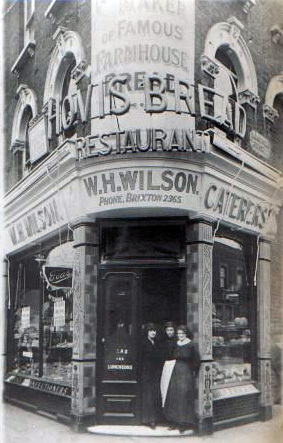 Wilson’s Bakeries Ltd was open for 100 years from 1886 to 1986 when David Wilson, William’s son, sold the business to an Italian baker. The bakery at 66a was always known as ‘Head office’ in the Wilson family and was the main bakery for buns, doughnuts and other less fancy cakes. 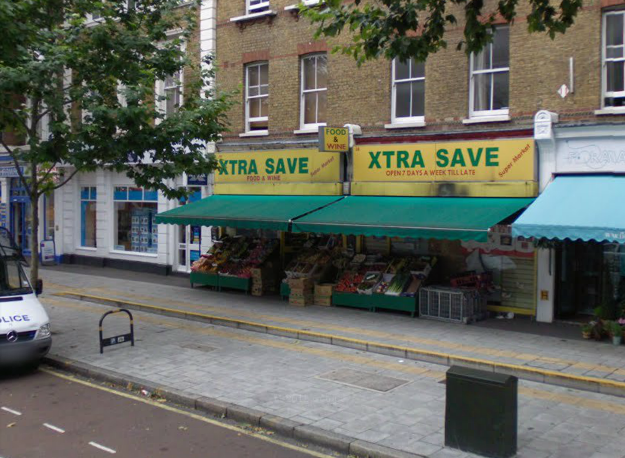 As well as the Brixton Road premises William also had six other bakeries. One in Dorset Road which is now a block of flats. 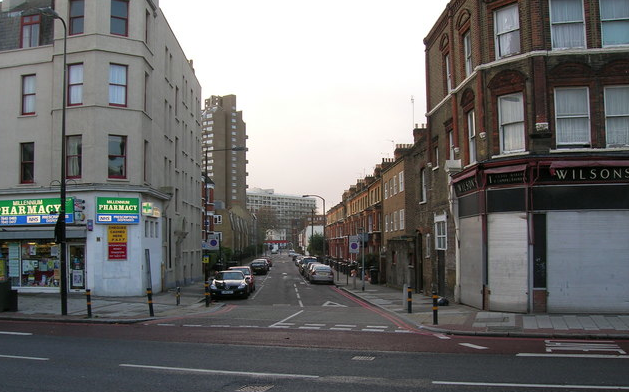 A premises in 198 to 200 South Lambeth Road which was the main bread bakery for the group of shops. Wilson’s were also in Brixton, occupying an arch on Station Road, this shop was an excellent place to sell off everything from the other shops on a Saturday afternoon so on Monday Wilson’s could start with all fresh goods in all shops and no waste. Another Wilson’s bakery occupied the corner of Daneville Road in Denmark Hill. This shop was the main bakehouse for cakes and fancy goods. 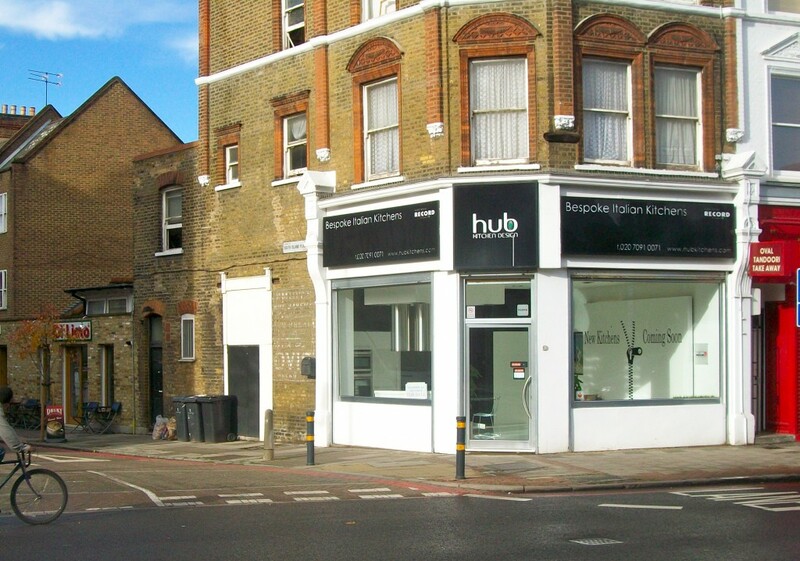 There was also a bakery at 40 Kennington Road, and the sixth and final premises in Newington Butts near Elephant and Castle. Above – inside 66a in 1910. The shop was clearly in the Victorian style with stuffed birds and every space filled with produce and ornaments. 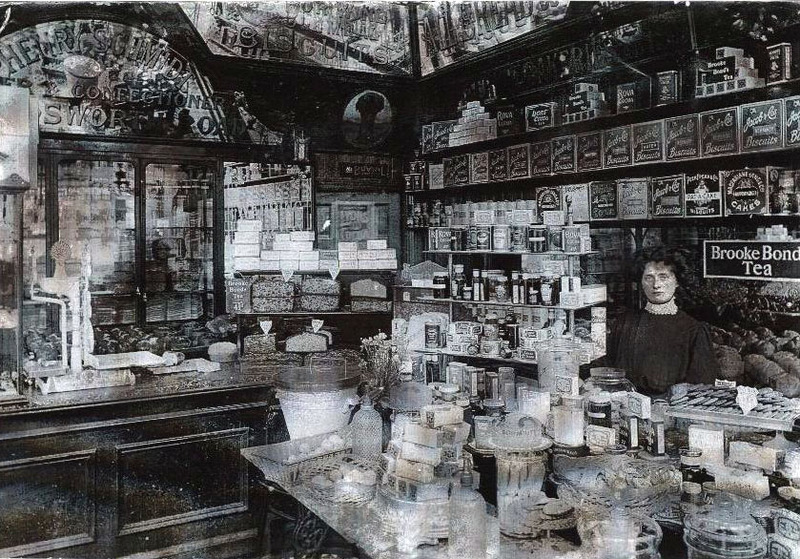 The woman behind the counter is Amelia Schmidt’s sister, Amy Shuff. ‘At the age of eight or nine (1951-52) my mum would put me on the East Kent Road car from Birchington, Kent in care of the driver and be dropped off at the Oval station where Hilda would meet me. This was a regular holiday adventure and any one who went to 66a got a job to do. This practice continued for me through to 1962 when I started full time employment myself. I helped in the bakehouse and quite often I got the donuts to fry. Later on I progressed to managing a shop for an afternoon or a day, driving the vans to do the delivery to shops and schools and other institutions. One of the bakehouse jobs was to clean out the mixing machines and the cream mixer. I ate most of the contents before washing it. One day, when my uncles Richard and David were on holiday, I had to pick up the baker (Jake) from Streatham Hill at 5:30 am. I didn’t wake up until 6:00am so I went down to the bakehouse and started the bun making process myself. I knew the recipes and how to use the machinery by observation and limited hands on experience. By the time Jake got to the bakery, the mixing had taken place, the dough was proved and I was just cutting up the dough and weighing it when he turned up. He took over, and between us we finished the job on time. A couple of hours later, my aunt Hilda came through and announced there were lumps of dry flour in the buns. They still went out and were sold out into all the shops! Oops! Easter time at 66a was very busy. Hot Cross Buns were the only things made there during the Easter Period and it was a 24 hour operation. The police drivers knew where to find good buns and they would come along and tap on the window of the bakehouse and buns were provided. In those days hot cross buns had crosses put into them with a wooden block shaped as a cross. This was done after the first proving (allowing the dough to rise before baking). Sometimes the crosses ‘proved out’ vanishing in the rising process and the proving had to be done again until they stuck. Truffles were a favourite of mine too. Nothing went to waste, even the stale bread was toasted and bagged up and sold to greyhound kennels where they would feed it to the greyhounds soaked in milk. My father was David Merritt Wilson and I worked Saturdays with him when I was about 12 (1967) as my older brother John was concentrating on exams. Dad later became ordained into the Church of England as a priest worker (he still baked bread) and took many a service at Christchurch just a few streets away in Brixton Road. 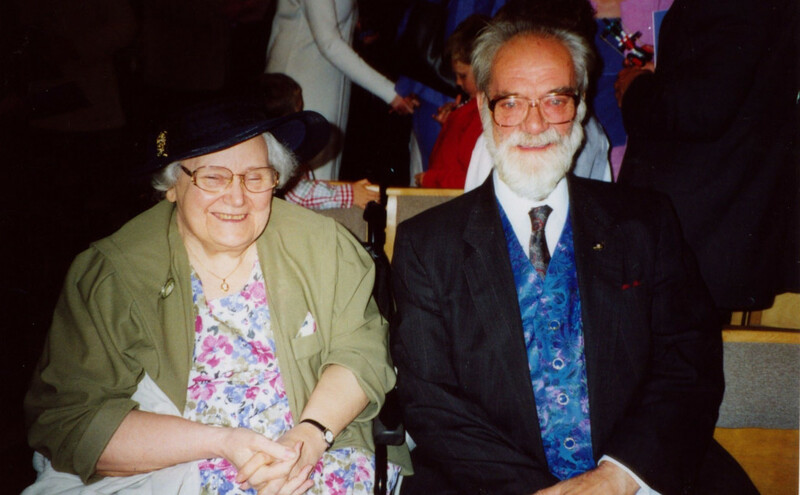 In fact my sister played the organ and mum, Ruth Wilson, as church warden took the church commissioners to the House of Lords when they wanted to close the church to keep it open. I believe it is a Byzantine design with an outside pulpit! My Brother John, sister Barbara and I all worked in the bakehouses both in South Lambeth Road and Brixton Road. We would start at about 2 in the morning and make bread. I learned to knead the dough and use the slips and peels to load and unload the ovens. They were originally coke fired but were converted to gas. Behind the ovens was a storeroom which had originally been a stables for the horses used to deliver to the market and other shops. I have happy memories of time with my father being taught so many things and listening to world services comedies such as ITMA and Round the Horne until my uncle arrived to deal with cakes and liked to listen to classical music. ‘I lived above the shop until my Grandad, David Wilson, sold it in 1986. My early childhood was spent in the bakery filling doughnuts and eating meringues. It had a good effect on me as I have carried on the family tradition and trained as a pastry chef in Westminster Catering College, Vincent Square. When the Wilson’s shop sign was removed (you can see the sign in situ in the first picture at the top of this page) it revealed the original glass Schmidt’s sign, unfortunately both were disposed of. 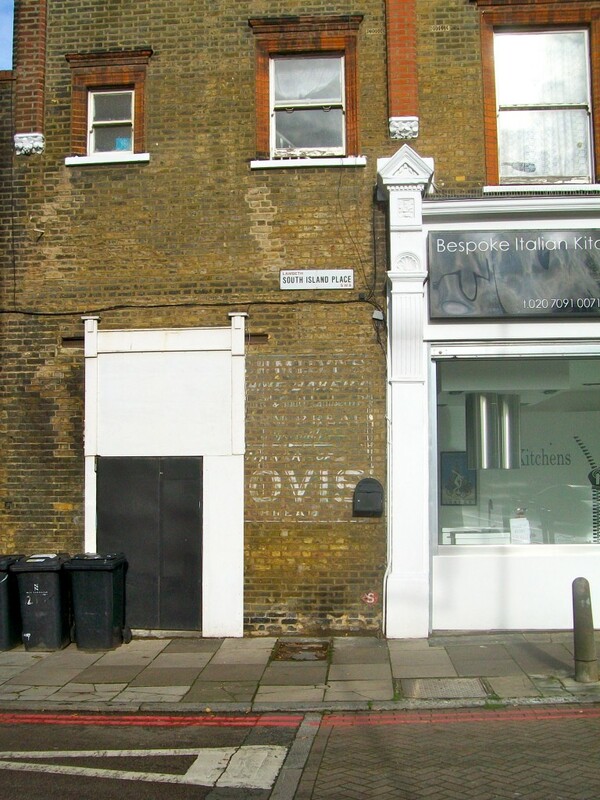 The one hundred year history of baking on this spot was not entirely erased however as also in 2009 the Di Lieto family won a long battle with Lambeth council to build a new bakery at the back of 66a. Thankfully permission was eventually granted, a bakery rebuilt and the wonderful smell of fresh bread fills the air once again. It seems that certain spots retain their history, Wilhelm, William and Amelia would be proud. All about William and Nancy’s family…. Above photo – the Wilson family at the wedding of John Wilson to Muriel Wade, the parents of Ken and Guy on 31st May 1942. 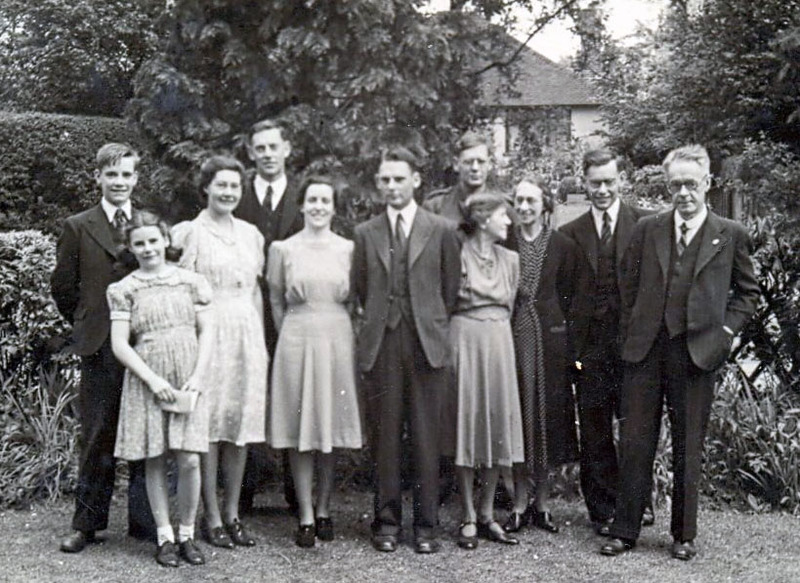 Left to right – David, Margaret, Hilda, Robert (back row), Muriel (the bride), John (the bridegroom), his mother Nancy, Richard is behind her, Nel Wilson, William (Junior), Will Wilson (formerly Schmidt). William and Nancy’s firstborn was a daughter called Hilda Wilson Schmidt who is still alive today in a nursing home in Northamptonshire aged 98. 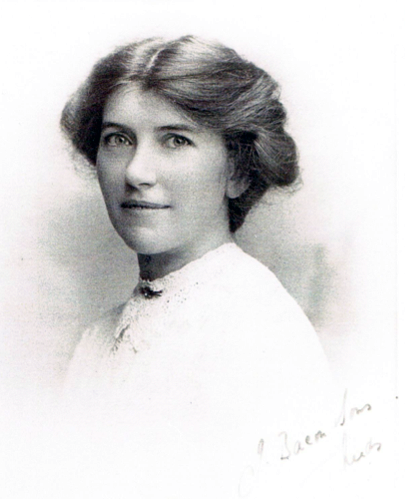 Hilda’s name was changed to become Hilda Wilson Wilson. She worked in the shop at 66a all her working life until around 1977. She was very devoted to looking after her mother Nancy who was crippled with arthritis for many years until her death at the age if 80 in 1970. The next in line was a son – Robert Grant Wilson who wanted to be a farmer when he grew up and when he was very young in 1936 his father bought Red House Farm in Margate for £2850 and two years later gave it to Robert. Robert died on 27 December 2007 aged 90. We still own the farmhouse and about four acres of land. The remaining land was sold off on 1979. Above – Robert G Wilson aged 88, below – Red House Farm, Margate. Next came Richard who worked in the family business until retiring when he sold his shares to his younger brother David. Richard spent a few years in the Army as a non-combatant officer during World War II so never fired a rifle or fixed a bayonet. 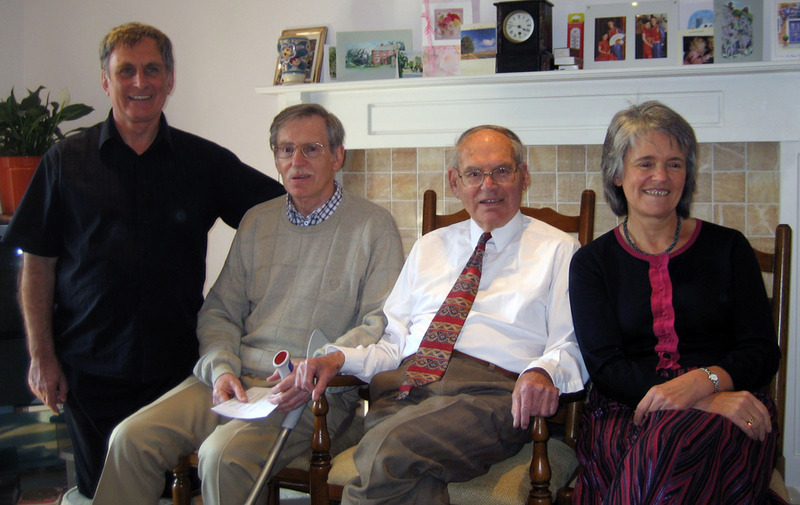 Next came John Derrick Wilson who married Muriel Wade of Hornchurch in 1942, parents to Guy and Ken who have contributed so much to this feature abou their family. John also wanted to become a farmer and worked with Robert at Red House Farm during the early part of the war and then became a tenant farmer on land owned by Spurgeons Homes in Birchington known as Homestead Farm. 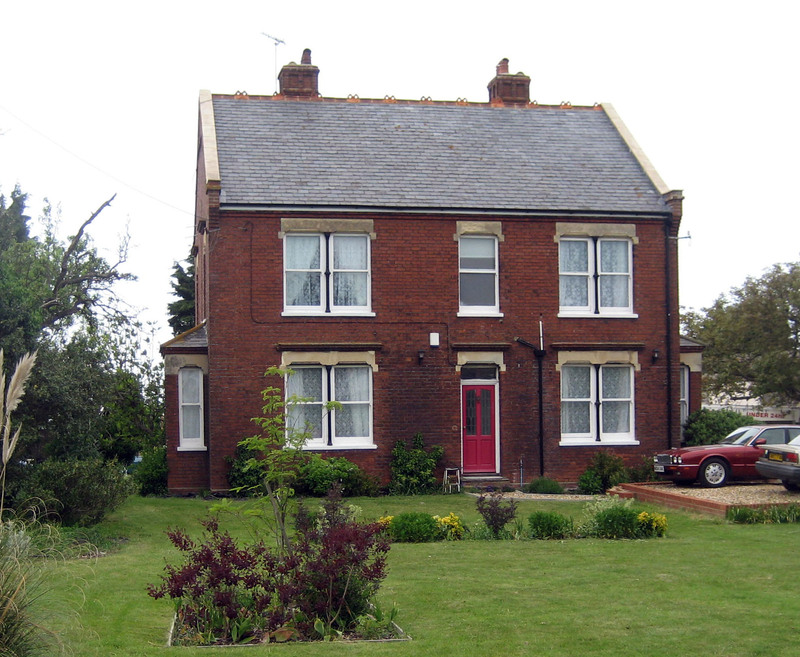 The fourth son of Will and Nancy was William who also worked at Red House Farm as a young man and married another Hornchurch lass and lived in Margate near the farm for a few years with two children, Patsy and Hugh. After William came David who later became the first “worker priest” in the Church of England and in a letter to me several years ago he claimed, “I changed the face of the Church of England”. There was an element of truth in his bold statement in that the BBC did a documentary on David’s life as a baker and a part-time Anglican minister. He had a tremendous love for people and would often be found in Wandsworth Prison alone in a cell with men who had committed murder and were serving life sentences. 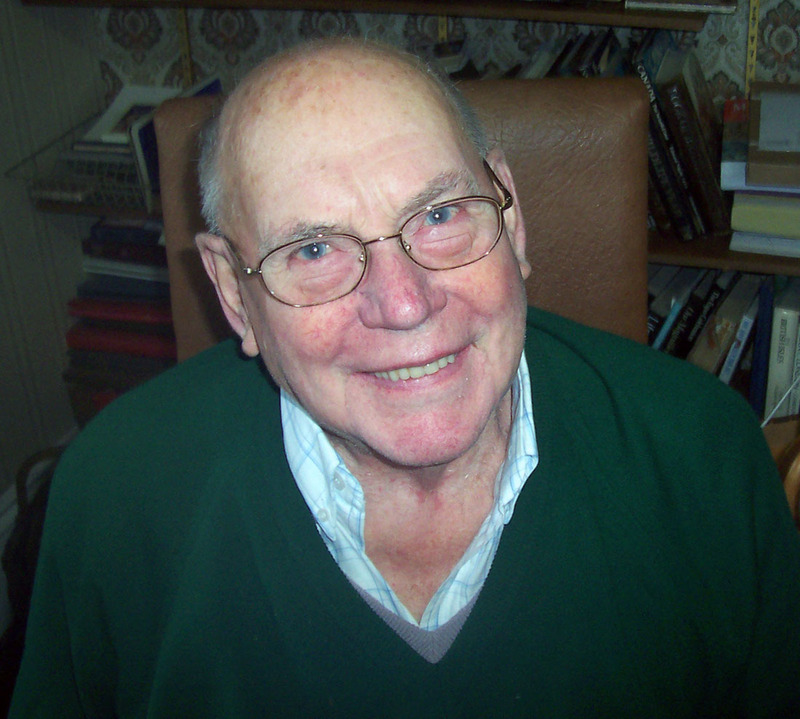 David passed away in 2004, click here to read his obituary notice from the Church Times newspaper. David’s wife Ruth was an amazing lady in her own right. Her maiden name was Marriott. She grew up in Vassell Road. Around 30 years ago the Anglican Church just 50 yards from 66a Brixton Road was scheduled to be closed because there was hardly a congregation any longer. 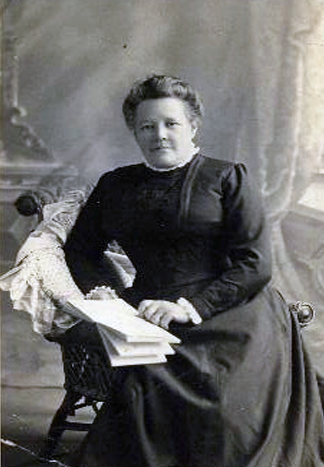 Ruth spearheaded the fight on her own up to the House of Lords to keep the church. She won. The church today is thriving. The Wilson family left their mark in the area. After David came the second daughter called Margaret who married Colin Gulley in 1956 at the age of around 27. 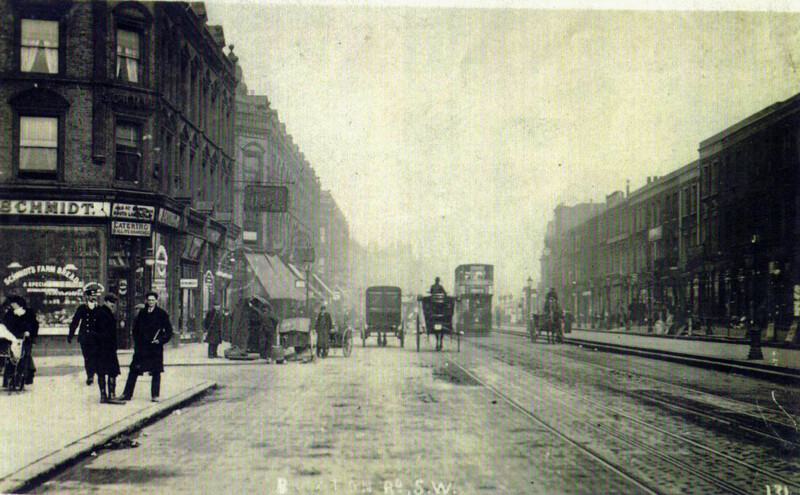 Another view of the Denmark Hill shop – date unknown. 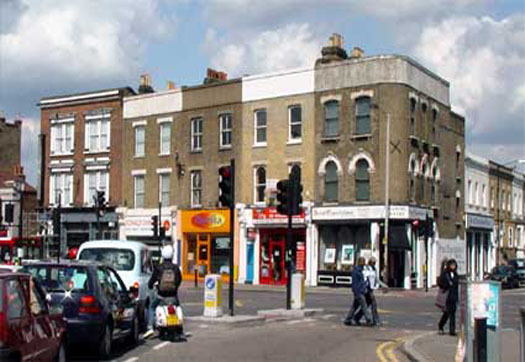 The photograph below shows the building that the bakery once occupied in Brixton. it is now an unused arch. I recall Wilson Bakery. My family had started their own Patisserie in 1978 at 318 Kennington Lane, SE11. I also knew Di Lieto bakery for a time because often we would run out of flour and would borrow some from them till we got our own delivery. I recall Di Lieto once telling me he owned the freehold of Wilson bakery which had been closed by then. As a kid at school, I can always remember seeing a large man with a very large beard in the bakery when my school bus (109 or 159) would pass its premises. I seem to recollect that the beard was ‘ginger’ am I right on that or is someone else I thinking about? That would be either David Wilson or John Wilson (David’s son) depending what year you were at school on 109 or 159 bus. Oh my goodness. How often I was inside this shop owned by my friend Margaret’s Father. So lovely to see her photo in the wedding picture, exactly as I remember her and her brother David. David was always very constrained and very much under his father’s thumb. But I liked him because he was good looking and shy. I do not have happy memories of Mr Wilson though. He was a very strict Plymouth Brethren follower and Margaret’s mother was very downtrodden. My mother almost forbade me to go there because of her parents. There was another bakery on the South Lambeth Road, opposite Tradescant Road, called Wilson’s where we’d stop after school many times for cream buns. I think Margaret’s father also owned that but I am not sure. Oh I remember this shop they had pink and white meringues in the window but I was always frightened to go in as they had two big glass cases of stuffed birds which I hated. I still went in but not looking at them, I wanted the meringues more! I spent most of my school holidays in the 1950’s “working” at Wilsons Bakery in Denmark Hill. This was because my aunt Marjorie Claxton worked in the office and her sister Grace Claxton worked in the bakery. They lived over the shop at South Lambeth Road. My aunties worked and lived there from the age of about 18 until they retired at about 65. They were wonderful happy times and I have many memories of my times there. I would love to speak to you or answer questions to help you research for your film project. Love to catch up. Often wonder what happened to your aunts. My goodness. So long ago but I remember this shop because my friend Margaret (Maggie) Wilson’s father ran it and we used to go there when her father was out at some meeting or other. Maggie was scared of him. He was strict Plymouth Brethren and quite unpleasant, so I never went (maybe once or twice) when he was around. She had an older brother, David, I think that was his name and he worked in the shop. I love the photo and Maggie looks just as I remember her. Sad there are so few letters. This is such an absorbing record of the times long ago. War or no war they were happier times than those of today.